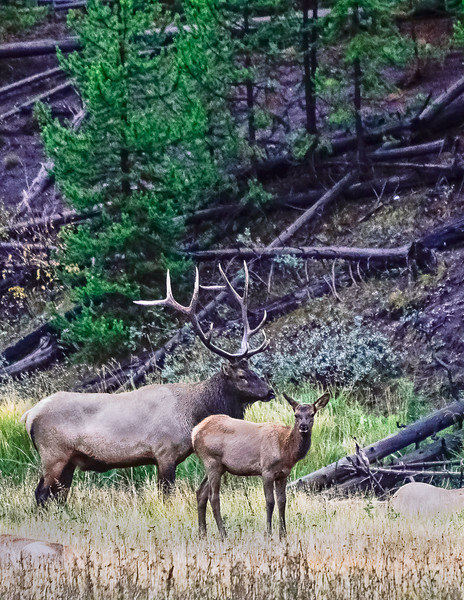 The Elk or commonly known as wapiti (Cervus canadensis) is one of the largest species in the deer family and one of the largest land mammals in North America. Elk are found forest the forest edges. Bulls engage in ritualized mating behaviors during the rut, including posturing, antler wrestling (sparring), and bugling, a loud series of vocalizations called a “Bugle”. If you have never heard an Elk bugle you have missed out on one of the iconic sounds of nature in the wild. A dominate Bull gathers a Harem of cows and will fight vigorously to defend them. Bull Elk and Calf of the year.